Geothermal is one of the most efficient" green ways" to heat and cool a building. Geothermal heating and cooling is becoming the most preferred source of heating and cooling. Geothermal heating and cooling takes advantage of the natural stable warmth stored in the earth. Normally the earth temperature is around 55 degrees F (13 degrees C) at depths of 10 ft. In climates warmer than 55, this can be used to air condition a building, and in colder climates (those under 55 it can be used for heating. This is accomplished by one of a number of methods. 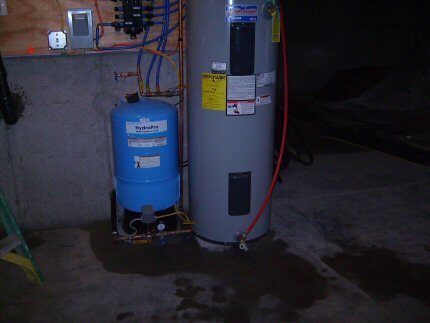 A geothermal heat pump uses the extracted water or transfer fluid (such as water mixed with antifreeze) as a heat source in winter and a heat sink in summer. Some geothermal heat pumps provide heating and cooling via forced air distribution, and others through the heating and/or chilling of water for radiant floor systems. 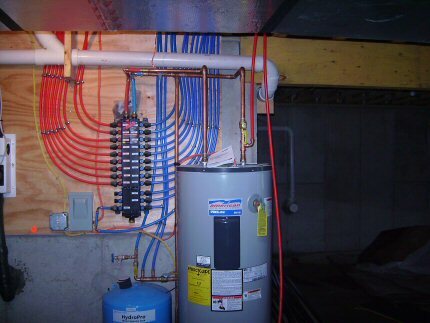 Some systems are used for heating domestic hot water. Geothermal heating and cooling systems use the natural constant ambient temperature of the earth to heat in the winter and cool in the summer. This is accomplished with a compressor or heat pump unit, the liquid heat exchanger medium, and the air delivery system. Quite simply, geothermal systems in heating take heat from the earth, transfer that heat to a refrigerant, then distribute the heat into the structure with a forced-air or hydronic system. In air conditioning, geothermal systems take heat from the structure, transfer the heat to the refrigerant, then transfer the heat back to the water or loop fluid. This works the same as a standard air conditioner, except a geothermal system uses water or loop fluid at a constant temperature (average 50 degrees) instead of varying outdoor temperature. In other words, it's like heating and cooling your home when it's 50 degrees outside all year! If you have a water well that produces a sufficient amount of water, the initial cost can be minimized by using a open loop system. If you do not have a sufficient well, then the cost is higher as you need to drill wells deep enough or excavate horizontal loops to use the earth's temperature. Geothermal uses electricity to power the loop circulation pumps or the well pump and the heat pump compressor. Otherwise, geothermal heating is much more efficient than air source or other electric heat. Geothermal heating and cooling requires no burning of fossil fuels at the heating or cooling locations, unlike other types of heating that use natural gas or heating oil furnaces. But in order to achieve the most comfort, geothermal heat pumps can be paired with a other heating systems to dramatically reduce the amount of fuel needed to heat the structure. 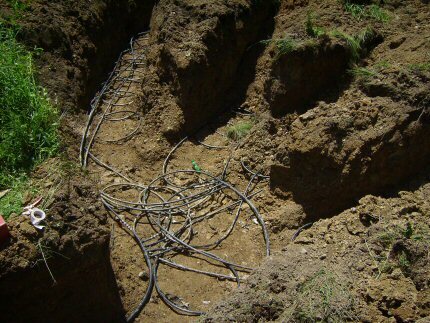 With geothermal cooling the heat is transferred from the building into the ground. Traditional ac transfers heat to the outside air which is hotter than the temperature you are trying to achieve indoors. 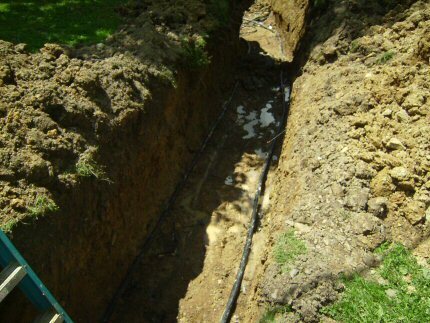 Since the ground temperature at a depth of 6 ft (3 m) is about 53 degree (13 C) and since the ground transfers more efficiently than air, geothermal air conditioning is much more efficient. 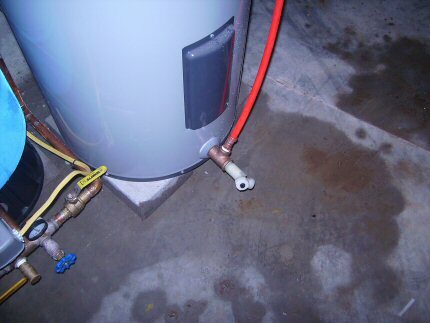 Also a large amount of excess heat is generated and can be used to heat your hot water, this also takes a little of the excess heat from the compressor. 1. The Evaporator Coil is a tube filled with water (Water Source Coil) and sealed inside of another larger tube filled with refrigerant Gas (Tube-In-A-Tube Heat Exchanger or a coaxial). 2. As the cold refrigerant Gas flows through the outside tube of the Evaporator Coil the water flowing through the inside tube of the Evaporator Coil warms the refrigerant Gas. (Purple) The heat pump cycle begins as cold liquid refrigerant passes through a heat exchanger and absorbs heat from the water circulating through the loop. Then the process starts over again. 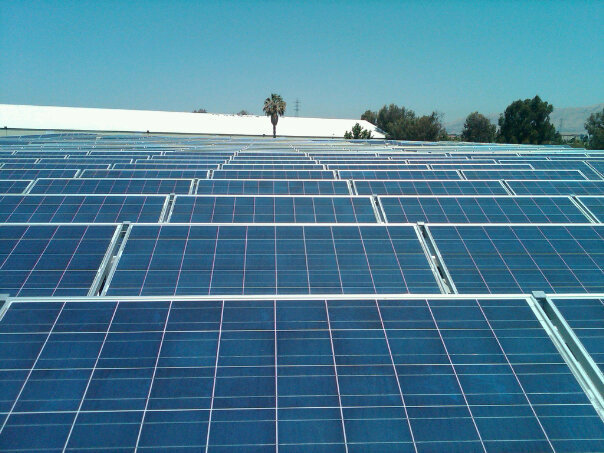 With geothermal air conditioning the process essentially works in reverse. This is geothermal heating and cooling in cooling. 1. The Fan blows air over the Evaporator Coil, cooling the Conditioned Air Space and warming the refrigerant Gas. (Purple) Moving warm air out of your house and through the Evaporator Coil absorbing the heat into the refrigerant Gas. Then the process starts over again. And thats how geothermal heating and cooling works! heating and cooling solutions for their homes. 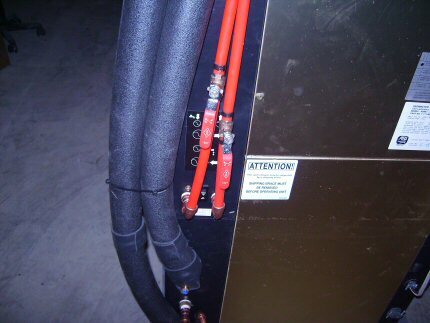 Most geothermal systems have a Hot Water Generator(HWG's) that take refrigerant from the compressor, where it is very hot, and directs it to another small coaxial heat exchanger. 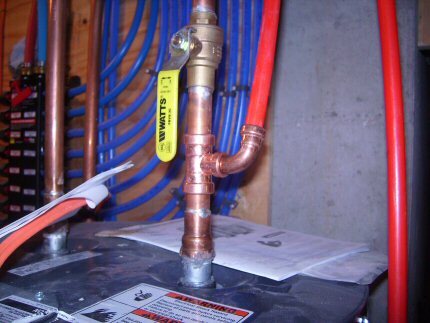 In this HWG heat exchanger, water from a domestic hot water tank flows through, picking up heat from the hot refrigerant. This heat exchanger is double-walled, and vented so that there would be no contamination from the refrigerant if a leak occurred. The HWG accomplishes three functions. First, it heats 60% to 80% of a home's hot water for FREE utilizing waste heat from the refrigeration process. Second, it increases the efficiency of the compressor by removing some of the heat from the compressor. Third, it increases the life expectancy of the compressor by allowing it to operate at a cooler temperature.Thus less future geothermal heating and cooling problems. Loops of pipe are buried in deep, vertically-drilled holes, often 200 ft (60 m) and greater below ground level and grouted. An increasingly popular approach, especially in residential geothermal systems, is a "slinky" coil. A slinky is a coil of plastic tubing spread out and overlapped in a trench and buried. Slinky coils are installed horizontally at the bottom of a three-foot-wide trench. 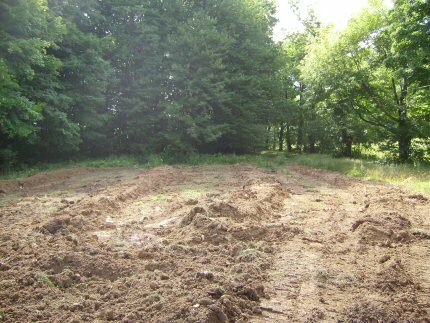 (Depth my vary by location, but at least 5 ft.) This method concentrates the heat transfer surface into small volume, requiring less land area and shorter trenching - a big plus for homeowners. With a closed loop system the transfer fluid circulates continuously through the heat exchanger (heat pump) and back out through the loops, absorbing heat from the earth during the winter for use inside your home or business. In warmer months, the fluid takes heat from indoors and transfers it back into the earth. Some closed loop systems bypass a portion of their working fluid with a thermostat to keep the source temperature stable. Pipes draw water from a nearby water well, shallow body of water or a spring. Once this water passes through the heat pump, it is released back to its source, generally as far from the intake as possible. 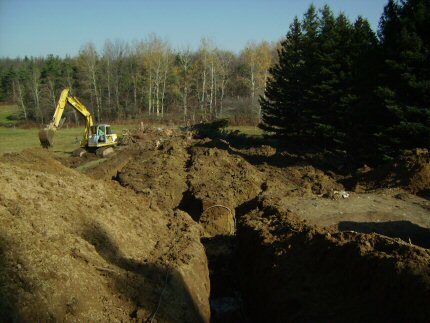 Since water from the Earth is a constant temperature (approximately 55 degrees F in the Northeast), the geothermal heat pump has a constant source of 55 degrees F energy with a open loop system. Geothermal Repair Information with annotated diagrams. Geothermal Heating and Cooling Information shows you how geothermal heating works and will help with your research or problem diagnostics.